Unlike other similar PLASTIC keyboards, this bluetooth keyboard housing is made of ALUMINUM ALLOY, and with outstanding chips and battery for better performance. 45 days money back and 18 months warranty. Professional customer service provided. This bluetooth keyboard supports THREE major operating systems: IOS, Android and Windows, workable for most of tablets and smart phones including iPad Air 2/1, iPad 4/3/2/1, iPad Mini 4/3/2/1, iPhone 7/7Plus/6S/6/6S Plus, Samsung Galaxy Tab, Galaxy S4/S5/S6/S7/S6 Edge/S7 Edge/S6 Edge Plus/ Note4/Note5, LG, Huawei, Nexus and More. With Bluetooth 3.0 chip, this wireless keyboard is 8 times faster than the Bluetooth 2.0. Automatically turn on/off power by simply opening or closing the keyboard, By pressing "Fn+C" simultaneously on the keyboard and connect the bluetooth. Housing is made of ALUMINUM ALLOY looks luxury. ABS Plastic low-profile keys type quietly and effortlessly. Built-in stand to hold and prop up your device at ideal viewing angle. Maintaining over 85% the typing space of a desktop keyboard, offers you same fast, natural typing experience. When folding this bluetooth keyboard, the width is only 2.20 Inch and weight 240g, easily stows in a backpack, pocket. Built in powerful 400mAh lithium polymer battery USB charging 4 hours last up to 65~75 Hours for continuous using, and standby time can be 180 days. Standby time: About 180 days. Folding size: 8.9 x 2.2 x 0.63 Inches, Open size:8.9 x 6.62 x 0.16 Inches. ✔Wide Range Compatibility: This bluetooth keyboard supports THREE major operating systems: IOS, Android and Windows, workable for most of tablets and smart phones like ipad,iphone,Samsung, LG, Nexus, Huawei, ZTE etc. ✔Smart and Easy Operation: With Bluetooth Broadcom 3.0 chip, this bluetooth wireless keyboard is 8 times faster than the Bluetooth 2.0. Operating distance can be 10m. Automatically turn on/off power by simply opening or closing the keyboard, By pressing "Fn+C" simultaneously on the keyboard and connect the bluetooth, then you can start your work immediately. ✔Aluminum Alloy Housing with Stand: Unlike other similar design plastic keyboard, this bluetooth keyboard housing is made of ALUMINUM ALLOY makes it smooth and luxury. Built-in Kickstand holders to hold and prop up your device, you can use your tablets and smart phones at an ideal viewing angle. ✔Natural and Small: Aluminum Alloy housing and ABS material keys. Maintaining over 85% the typing space of a desktop keyboard, the wireless keyboard offers you same fast, natural typing experience. 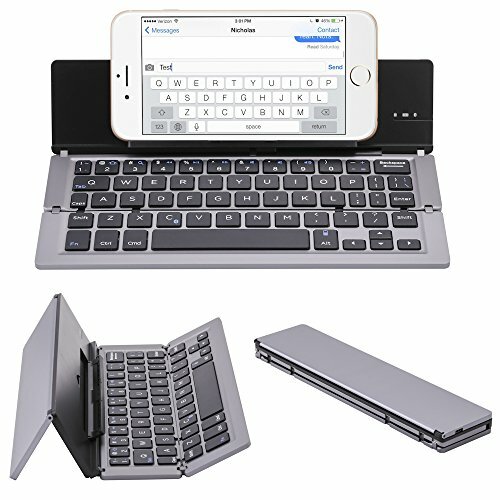 When folding this bluetooth keyboard, the width is only 2.20 Inch, easily stows in a backpack, pocket, it's portable and lightweight.